Imagine my surprise when I rose early this morning to walk my dogs before beginning a long day of blogging, only to find my own image on the K9 Kamp post at Peggy's Pet Place. Wow! It was truly a morning of surprises. I continued on by opening my email, and there I discovered a notice that as this week's featured blogger I get to share some info with you on one of the great prizes that participants can win, as well as posting the Rafflecopter giveaway widget in my post. I love to run giveaways for my readers, so I'm totally in for this! What a great day it is looking to be. If you haven't yet signed up for K9 Kamp, it's not too late. You have until Tuesday or Wednesday next week to complete the first challenge. 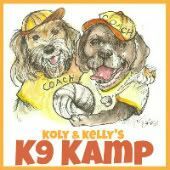 Our hosts for K9 Kamp, Kol's Notes and Peggy's Pet Place, have started us out easy with a simple assignment: Walk (or any other active movement) with your dog for a total of one hour during the week. You can split it up any way you like, as long as it totals an hour. Basically, their goal is simply to get you motivated to start exercising with Fido. To help you out with motivation, Jodi and Peggy have collected over a $1000 in prizes to award throughout the event. There will be weekly prizes and a grand prize package. I get the honor of telling you about the fetching sticks from Molly Products. Jodi tells me that "these sticks are made from the fragrant Juniper wood of Northern Arizona. Each branch is cut to 10" long, stripped of it's bark to reveal the fragant Juniper wood underneath, hand-sanded to remove protrusions & rough patches, then bevelled at the end. These beautiful, hand crafted, Eco-friendly play toys are ideally designed for outdoor entertainment for you and your pet! The simple game of "throw and fetch" brings relaxed fun and treasured time with your dog." I can tell you that Tanner, my Golden Retriever, would be all over these sticks. He loves playing fetch, both at the dog park and in water. I was excited to see that they float in the video on their website. I think Fetch is Tanner's favorite daily activity--swimming and bringing something back to me. His Retriever DNA is really working well despite his less-than-perfect Golden Retriever conformance. You can purchase your own set of Fetching Sticks from Molly Products here. This week's entries in K9 Kamp get to participate in a giveaway of these high quality fetching sticks, and I got nominated to show off the Rafflecopter. Yes, I think it's fair to assume it will show up on Fido's Freebie Friday as well. In order to enter this giveaway, you need not have have signed up for K9 Kamp with Kol's Notes or Peggy's Pet Place nor completed this week's challenge as outlined above. They just want you to check it out, which you have just done by visiting my site and reading a little about the program. You can still join in for the remainder of this week and the upcoming four weekly events. I hope to see you all at K9 Kamp, where Tanner and Oliver and I are enjoying the camaraderie of this Internet 'get fit' plan. The contest will run through Thursday, Sept. 15th at 12:01 AM and your K9 Kamp hosts will announce the winner next Friday, Sept. 16th in their Featured Blogger post. Happy tails! Full Disclosure: A pair of Fetch sticks are being provided to Kol's Notes and Peggy's Pet Place as a prize. I have not reviewed this product and the giveaway is not sponsored by my blog. I am simply assisting with promotional efforts as a part of the K9 Kamp event. There was a rafflecopter form for the same giveaway on Kol's Notes. Are we allowed to enter both? Hi Cynthia! The Rafflecopter updates in both places and you can absolutely enter on both blogs! Schooner and Skipper love fetching sticks. They would love the fetching sticks if they float. Anything that float in the pool is the greatest for them. we'd love to win b/c our dogs stink at fetch and we are trying to teach them!! I would like to win so I can play fetch with my dogs!